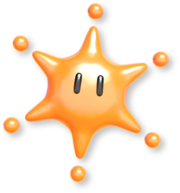 The Big Paint Stars are the source of color that appear in Paper Mario: Color Splash. They are larger versions of the Mini Paint Stars. There are six of them in the game, each one being a different color: red, yellow, blue, purple, orange, and green. Each one is guarded by a Koopaling (except for Roy). Collecting all six restores color to Prism Island and allows Mario and Huey to go to Rainbow Road to face Black Bowser and rescue Princess Peach at Black Bowser's Castle. Bowser, possessed by the black paint, threw them far away from Port Prisma. Each Big Paint Star, when rescued from the Koopalings, repaints big areas which can't be painted by Mario's hammer normally and tells a little part of the game's story, although disordered. Finally, when the last one is obtained, it reveals what actually happened to Bowser. The red star repaints the Scarlet Gate in Sunglow Ridge, the yellow star repaints a giant coin in Mondo Woods, the blue star repaints the entire sea in Violet Passage, the purple star repaints the gigantic sinkhole in Mustard Cafe along with the entire rest of the world map's sea, the orange star repaints the Draggadon fossil in Marmalade Valley, which results in it transforming into the real monster, and the green star repaints Luigi's kart somewhere else on Prism Island. Mario and Huey getting the red Big Paint Star. The Big Paint Stars at Prisma Fountain. The Big Paint Stars resemble the Grand Stars from Super Mario Galaxy and Shine Sprites from Super Mario Sunshine. The jingle played when collecting a Big Paint Star is remixed from the first few notes of Paper Mario's opening theme. The Big Paint Stars match the color of the wand of the Koopaling that guards it. This page was last edited on February 25, 2019, at 01:24.